I hope everyone is well and enjoying the break. Pre-season training is not too far away, but to be honest as a coaching staff it hasn’t stopped for us, we’ve been out watching many players and games. I’ve spoken to a number of new players for next season and been hard at work to tie up our own ones. It’s not a nice time of the year for managers when you have to make decisions on players’ futures, especially when you have a good relationship with them, but it comes with the territory. I wish the players that have left the club all the best for the future and thank them for their efforts. As it stands, we have 14 players signed, including Ouzy See, who of course will not be ready for the start of the season, and have offers out to another three players from last year’s squad who are considering their futures. I have also put offers to a number of players, however at the moment we seem to be either getting blown out the water with players getting crazy offers from other teams or finding players are unwilling to commit as they wait until all offers are put in front of them. It is a bit of a waiting game at the moment, but we will have some more news for you soon. Looking back to last season, we managed to get ourselves safe with four games to go. I take no satisfaction from that and really it was just a relief when we got it done and dusted. When we came to the club the aim was to first and foremost be safe, but to push towards the play offs. It hurts that the last bit certainly didn’t materialise, and no-one knows more than me that results weren’t good enough. For me the league was pretty strong last year, which is maybe why there was such a gap between the top and bottom teams. There were some very experienced players at other clubs: Sean Dillon, Darren Barr, Darren Smith, Rory McAllister, David McCracken and David Goodwillie to name a few. All these players have played at a pretty high level and it is very difficult for us to attract these types of players. Having said that, we proved that on our day we could compete against these teams, with results such as the win away to Peterhead in September giving us confidence. There has to be a bit of reality of where we are at financially as a club at the moment. It’s no coincidence that teams with the lowest budgets ended up towards the bottom of the league. However, it’s my job to change that and bring good players to the club within a sustainable budget. I have to find players with a hunger, desire and a main interest that is not just money. The club has to live within its means, I get that, and I think everyone has to understand that before we can move forward. We’ve brought in Adams and Murphy, two very good players and champions from the Juniors last season, who are desperate to prove themselves at a professional level. If we don’t have the budget of other clubs then we have to create a good atmosphere at Shielfield where players want to come and play. The supporters have been great at getting behind the team, as they know that the players are trying their best and giving 100% for the club, and I hope that continues into the new season. Young players will be given a chance to play. 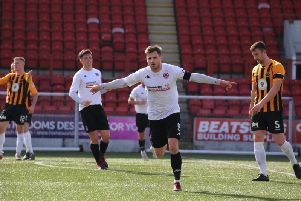 Godinho, McCrorie, Irving and Hamilton have all progressed after successful loan spells at the club, and our own young players Fleming, Cook and Orru have also improved and stepped up to the mark. Hopefully we’ve achieved a bit of a reputation for developing young players which will make the club more attractive to promising young players. It’s about getting the right type of players around these boys and creating a spirit, not just the team but around the club. We are creating a work ethic and with a bit of ability added to that we will improve and be better. The team I played in weren’t the best individual players in the league, but we were the best team as we worked hard for each other, had a bond that is still there, and probably had as good a relationship with supporters as any team Berwick as ever had. Enjoy the rest of the break and I’m sure the media team will keep you to date with any developments.